The history and significance of one Wheatbelt granite rock will forever be preserved thanks to the publication of a book. More than 70 Aboriginal and community members from the Pingelly and Brookton shires have celebrated its publication at a ceremony at Boyagin Rock. The rock, also known as Boodjin Rock, is sacred for Aboriginal people and has environmental significance as it is home to a number of rare plants and animals. The rock sits in the Boyagin Nature Reserve, 10 kilometres south west of Brookton in the Pingelly shire. 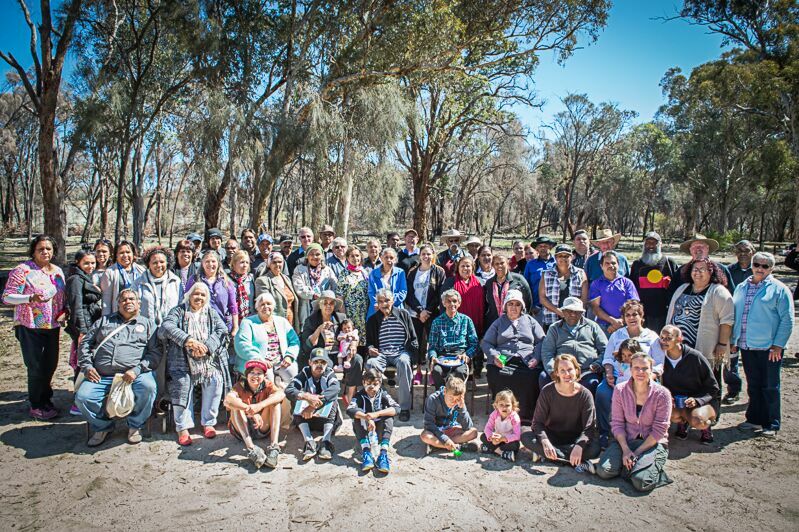 Last year natural resource management group Wheatbelt NRM recognised the importance of the sacred site and began recording stories from the Noongar Elders. Wheatbelt NRM’s Aboriginal NRM project delivery officer Kerry Collard said the book now played an important part in the preservation of those stories. “The Boodjin Rock Story is significant to Noongar people as it tells a part of our sacred creation story, connected to the Wargal or serpent because of the fresh water in and around the rock” Kerry Collard said. Pingelly Elder Mervyn Abraham attended the ceremony and said his family had a special connection with Boodjin Rock. “This is a place of spiritual significance and we want to preserve its history and let people know about it,” Mervyn Abraham said. Vivienne Hansen was originally from Brookton and said it was important to have the rock’s stories published in a book so they didn’t get lost. “Most people think it’s just a rock, but it goes deeper than that for our family,” Vivienne Hansen said. “This place provides spiritual healing for us and it helps us renew our connection with the land. Wheatbelt NRM’s Kerry Collard said the book would now be used to guide future management of the site. The book was part of Wheatbelt NRM’s Culturally Significant Sites project, funded by Australian government’s National Landcare program. The Pingelly Tourism group in partnership with Department of Parks & Wildlife, Seabrook Aboriginal Corporation & Gnaala Kaala Boodja are now working towards promoting the Boodjin Story, including the redevelopment of the picnic area at the site. Kaya (hello)! Noongar katadjin (knowledge) of boodjar (country) is a precious thing and a privilege to learn. This storybook offers a glimpse of the rich katadjin surrounding Boyagin Rock. This katadjin is passed on to new generations of Noongars (the Aboriginal people of south-west Australia), both in rural and metro areas, whose moort (family) connections to Boyagin are strong.